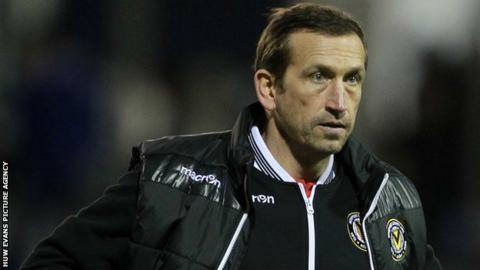 Newport County manager Justin Edinburgh says speculation about his future may have affected his players. Newport's last two matches have ended in heavy defeats to Cambridge and Northampton, but they are still sixth in the League Two table. Edinburgh, 45, was linked with the vacant manager's position at Gillingham but has signed a new deal with County. "Did I think it took my eye off things? Not a chance. But I can see it from a player's perspective," he said. "I fully understand the concern and I understand the speculation, and I understand the link with Gillingham. "But I think people know... that I won't take my eye off the ball here." Edinburgh has been linked with a number of jobs since leading Newport to promotion from the Conference Premier in 2013. Although the former Tottenham defender insists he is unaffected, he admits the speculation could have unsettled his players. "Of course it will have. It's a group of players, a lot of them have been here more or less since the day I walked through the door," he added. "As a manager I have to make sure I do not use it as an excuse." Meanwhile, Newport are being linked with Swindon Town forward Miles Storey after Edinburgh said County were in ''advanced'' talks with a League One striker. Storey, 21, has been on loan at Portsmouth this season. Newport are next in action on Saturday, with second-placed Shrewsbury visiting Rodney Parade for a League Two encounter.